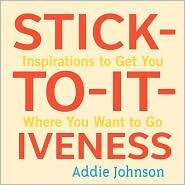 Addie Johnson's Stick-To-It-Iveness: Inspirations to Get You Where You Want to Go is the third and final inspirational book I had by the author. It's not the best or worst of the three. It has more humor than the other books, but like the first one, Lemons to Lemonade, I found an error in it. A Little Book of Thank Yous was actually the best of the three. But, this one has something neither of the others do: a few stories of animals, stories that are always popular. Much of the book is based on a quote from Thomas A. Edison. "The three great essentials to achieve anything worthwhile are, first, hard work; second, stick-to-it-iveness; third, common sense." The author claims there is nothing we can't accomplish if we put these three qualities together. And, the anecdotes included in the book show the importance of stick-to-it-iveness. I'm not going to give away the ending of Franesca Faridany's story of "doggedness," but it's an important story with a funny ending. Johnson quotes people from Winston Churchill to Martin Luther King, Jr. to prove her points, but animal lovers will also like the examples shown by the efforts of dogs, penguins, and butterflies. Johnson does pick excellent quotes for her books. My two favorites in this one? "It may be that those who do most, dream most" is by Stephen Butler Leacock. Poet E.E. Cummings had my favorite one. "It takes courage to grow up and become who you really are." If you're looking for inspiration, combined with humor and anecdotes, Addie Johnson offers Stick-To-It-Iveness: Inspirations to Get You Where You Want to Go. Stick-To-It-Iveness: Inspirations to Get You Where You Want to Go by Addie Johnson. Conari Press, ©2010. ISBN 9781573244749 (hardcover), 112p. FTC Full Disclosure - The publisher sent me the book, in hopes I would review it.